Art Spiegelman climbs the rope and rings the bell with this Pulitzer Prize-winning graphic novel about the Holocaust and his parents who endured it all. 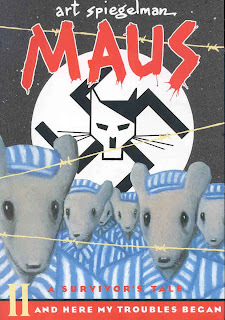 MAUS is indeed powerful in its presence and breathtaking in its sadness and honesty about the family’s fight to live in a world where their very existence was despised, but this is no typical tale of the Holocaust. This is about how such horrors permeate the very soul and trickle down to the children of survivors. Spiegelman weaves two tales of woe. The first is of his father and mother, Vladek and Anja, and their journey through the Hell that was the Holocaust. The second centers on the ramifications that befell the Spiegelman clan post-war. Affectionately called “Artie” by his father, Spiegelman exposes the holes in his family structure – the suffering and sorrow that surrounds the family – straining the father-son relationship. MAUS is painful to watch, painful to read, painful to experience. There is so much sadness, too much for one family to endure, and it shows in the scars – superficial and subconscious – that influence every aspect of the father and passed down to the son. MAUS is more than pain. It is a befuddling story of human psychology. That Anja kept the strength to endure the hate, only to take her own life after the war was over is but one aspect that confounds and angers me. How can Vladek be the victim of such hatred and yet harbor his own hate for African Americans? It is this irony and hypocrisy that makes MAUS resonate. It is a real story about flawed people and the pain of the human existence. It is certainly an interesting choice to use the comic format to tell his story. It is daring to then portray the characters as animals, but through his careful crafting between time lines and the intricate weaving of meta-fictional storytelling, Spiegelman ends up with a story that transcends his own family. Missouri State University was hosting a book talk on Jewish graphic novel literature at the time I read MAUS. As one member of the group noted, Spiegelman uses a technique described by Scott McCloud in his book, Understanding Comics, whereby the characters are drawn with little detail while the backgrounds are much more detailed. The generically-drawn characters allows the reader to assume the role of the protagonist, while the detailed backgrounds set the stage for a genuine experience. Most American comics, in contrast, are very detailed which creates space, according to McCloud, between the reader and the text. The technique worked in MAUS. The art of this graphic novel, the crafting of the visual story, is compelling in itself. Spiegelman layers the art in a way that is not typically used in other comics. He also creates panels in which history and present collide and resonate. To be used in a classroom setting, I would probably wait until high school before introducing MAUS. The work is powerful and deserves to be studied for its many intricacies. MAUS is about the Holocaust and it pulls no punches. There is not enough space to write about how MAUS could be used in the classroom. As a piece of literature, the story works on many levels. The role of God in the lives of persons and the feelings of betrayal are but one aspect. The effects of tragedy on the victims is unconsciously passed down to children and even grandchildren. The definition of “survival” is key to understanding this book. The crafting of the art itself deserves independent study. 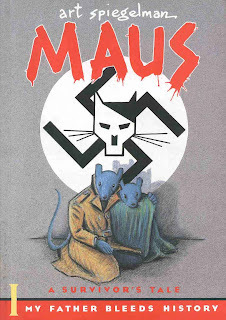 MAUS is indeed a piece of literature that deserves the acclaim and the awards it has received. MAUS is probably the most am not sure that another title will come any time soon. It is chilling, gripping and absorbing and I do not have a category or recommendation high enough for MAUS. THE ONLY COMICON FOR KIDS IS BACK!